When it comes to celebrating the spookiest (and often sexiest) holiday of the year, no other city in the United States does Halloween quite like Los Angeles. From Halloween takeovers of amusement parks across the Valley to haunted attractions and houses, there's plenty of daytime and nighttime entertainment coming to Los Angeles in October this year. However, if you're looking for an adults-only costumed celebration, these are the best events that are happening for Halloween 2018. If you're looking for Halloween street parties, haunted houses, theme parks, and other special events check out the full guide to Halloween in Los Angeles. This star-studded early Halloween bash at Hollywood American Legion Post 43 (2035 Highland Avenue) is a fundraiser for several cancer-fighting and support organizations. It includes live bands, DJs, a Lip Sync Battle, burlesque dancing, a dating auction, costume contests, and more. The fifth annual celebration will take place in mid-October in 2018 starting at 5 p.m. with a red carpet event immediately before the event. Visit the official Halloween Hotness website for tickets and information on the final date of the event. A creepy DJ dance party sponsored by the Ivy Plus Society brings adult entertainment to Hollywood each Halloween season. In 2018, the party will take place at the Apartment 503 Lounge (3680 Wilshire Boulevard, Los Angeles 90010) from Saturday, October 27, at 8 p.m. to Sunday, October 28, at 2 a.m. Costume prizes for Best Overall Male and Female, Scariest Male and Female, Most Clever, and Best Duo/ Group will be given away after midnight. Now in its second year, this party is sure to sell out, so get your tickets early if you hope to attend this exclusive event. Party with Egyptian queens and pharaohs in the classic courtyard of Hollywood's Egyptian Theatre, at this red carpet masquerade. The 10th annual King Tut's Tomb LA Halloween Party returns to the Egyptian Theatre on Saturday, October 27, 2018, from 9 p.m. to 2 a.m. the following morning. VIP tickets include open bar, and you can also purchase alcohol on-site all night long. Costumes are strongly encouraged but not required; however, you'll be mingling with some of the best in Hollywood so you better come prepared to dazzle if you plan to stand out from the crowd. The W Hollywood is having three nights of Halloween parties on its exclusive rooftop this Halloween season. Starting on Friday, October 26, 2018, with the Angels and Demons Halloween party, the events will continue on Saturday, October 27, with the Rooftop Halloween Party at the Loft and Wet Deck. Also on Saturday, you can attend the W's annual Gatsby's Masquerade Halloween Ball in the Great Room. Finally, the W closes out the week of celebrations with the W Hollywood Masquerade & Costume Halloween Party on Wednesday, October 31. Featuring four top Los Angeles DJs, two areas of music, and stunning views of the city, you won't want to miss this close-out party on Halloween night. On Friday, October 26, 2018, Hollywood's favorite spooky club crawl returns to four venues in the neighborhood. Tickets to the Hollywood Halloween Club Crawl range from $30 to $50 and grant you access to four venues with express entry and no cover charges as well as drink specials at each location. You can also have a free pre-determined shot or drink at each location. The event will also include prizes for best costumes, club crawl tour hosts, and drinking games at some of the venues. To get there, don't drive if you plan to drink. Instead, take the Metro to Hollywood & Highland, use a Rideshare App, take a cab, or hire a limo. The 10th Annual Ghostly Halloween Ball returns to Bar Sinister on October 31, 2018, starting at 10 p.m. and going until 3:30 a.m. the following morning. Featuring fetish performances by Bella Bathory's Femme Domme Fatale, performances by Bullet Height, DJ sets by Tommy, Amanda Jones, Rocky, Jpeg, and John C, and a costume contest with a $500 prize, this party is the best rock event happening this Halloween in Los Angeles. Bar Sinister is located at 1652 North Cherokee Avenue in Hollywood (90028), and the event is open to adults 19 and older. In 2018, you'll have four chances to catch a Halloween party at Los Angeles' famous Playhouse Hollywood club. You can attend an event on October 25, 26, 27, and on Halloween night itself starting at 10 p.m. and ending at 3 a.m. each night. No matter when you attend, you'll get to enjoy six DJs in two rooms playing open format, hip hop, and Electronic Dance Music (EDM). Playhouse Hollywood is located at 6506 Hollywood Boulevard in Hollywood (90028). Tickets are required in advance to attend and costumes are highly encouraged every night (even before Halloween). OHM Nightclub is hosting three Halloween-themed events this October. Starting on October 13, you can join in the fluorescent fun at Neon Nights of the Living Dead. On October 20, experience the Halloween Slasher Party, and on October 27, you can attend the Supernatural Party to round out the season of parties. 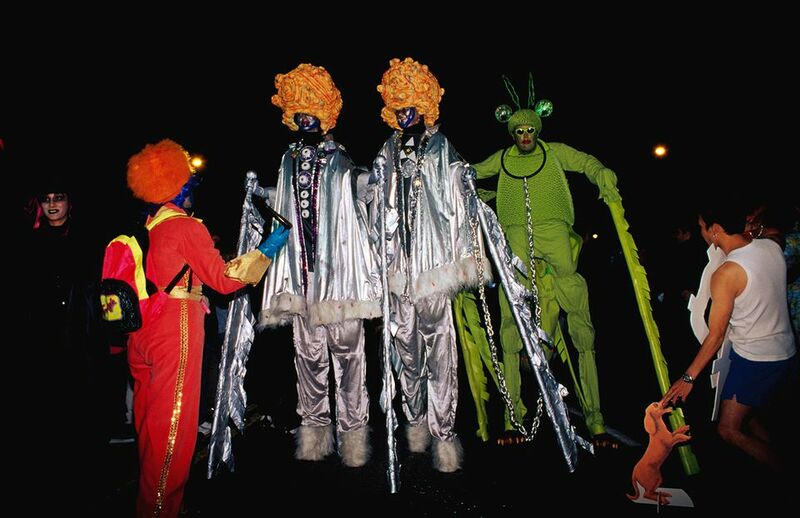 Theme-appropriate costumes are required to attend each night. OHM Nightclub is located at 6801 Hollywood Boulevard; tickets are required for each event, and you can buy them night-of at the door or in advance online. Minimal Effort Halloween returns to Los Angeles on October 27, 2018. From 8 p.m. to 4 a.m., this fun-filled party features some of the biggest names in electronic music including Boys Noize, Ardalan Presents Ardy Pardy, and Audiofly at the Belasco Theater (1050 South Hill Street) in Downtown Los Angeles. Advanced tickets are required to attend and range from $49 early bird tickets to $149 for VIP tickets, which includes table service and priority access to the venue. Costumes are not required to attend, but electronic music fans typically appreciate good outfits, especially during the Halloween season.